Creative Cloud everywhere on campus. Ready to get everyone excited about all their new creative possibilities? Adobe makes it easy. 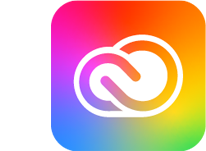 Right here, you'll find a wealth of free marketing templates to help you encourage software downloads and promote your institution's Adobe Creative Cloud offering to students, faculty and staff. Download or order posters, promo cards and other materials to let everyone know they can start using the tools today.